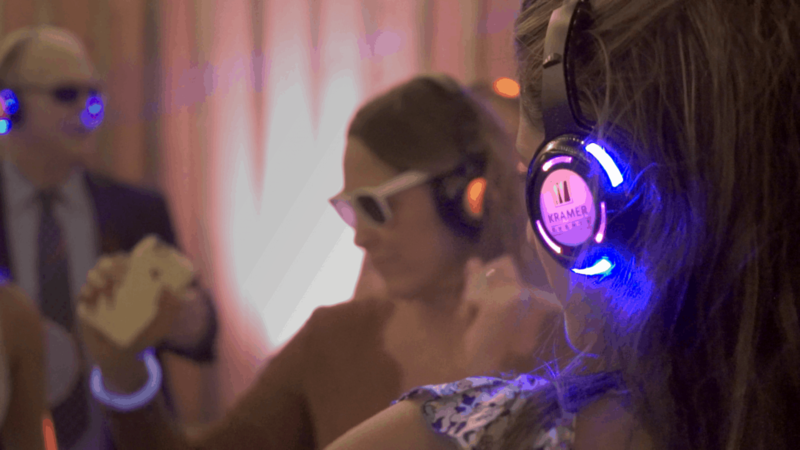 Silent Disco is an exciting new way to “After Party” without leaving your venue or disturbing neighbors. What noise ordinance? Party Past Curfew! The Silent Disco will continue to entertain your guests and keep your party going late night. Comfortable headphones make it a fun and easy way to keep the dance floor packed. Silent Disco is a fun & unique way of experiencing music. With wireless headphones, you and your guests can continue to enjoy the bumpin’ beats of the DJ and keep the party going without violating noise ordinances. Eliminate the need to relocate your guests for the after party with Silent Disco! When the Silent Disco headphones are on, the sound is crisp and clear anywhere in the venue. The Silent Disco offers an exciting new experience for those on (and off) the dance floor by creating an environment that is perfect for socializing while dancing the night away! The Silent Disco experience is actually better suited for holding a conversation during a party than at a venue with a traditional sound system. The ability to tune-in & tune-out of the music gives you the freedom to take a break, and there’s no need to lose your voice screaming over loud music. The Silent Disco headphones are also designed with movement in mind, and by partially or completely sliding them off, you can chat freely and still hear the music. While you’ve got your headphones off, take a look around. Its a blast to hear what the dance floor sounds like without music.